This spacious holiday park is located right next to a wonderful golf course. This is obviously the reason the holiday park is called Golf Océan Résidences. The site houses a number of spacious and detached villas. Three different types are available. There is the FR-40600-03. This beautiful villa is comfortably furnished, fully equipped with all mod cons and suitable for 4-6 people. In addition, there is FR-40600-05. This type is luxuriously furnished and also well equipped. The property can accommodate 6-8 people. Finally, there is FR-40600-04. 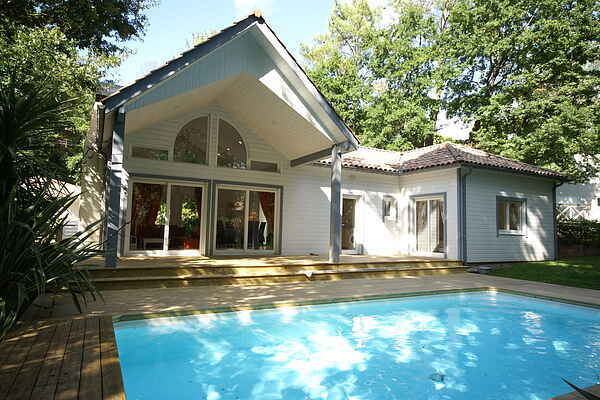 This villa is ideal for large groups because the home is suitable for 10-12 people. This villa is also tastefully decorated and fully equipped with all mod cons. All the properties have their own garden with a large private pool and in addition to the number of people, there is place for a baby. The villas also have a barbecue available.